Improved Your Bad Credit Card Habits? Don’t Backslide! 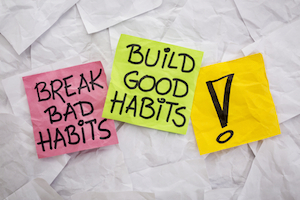 Let’s face it: Shaking off bad habits is tough. Most people don’t like change, especially when a new routine requires self-discipline and attention to detail. For instance, transitioning from credit-card junkie to responsible plastic user is difficult. And, unfortunately, it looks like a lot of Americans are backsliding into one bad credit card habit – carrying debt. Not sure what’s going on, or how to keep from falling in line with this trend? Take a look at the details below for more information. Before looking at the resurgence of credit card debt levels in the United States, let’s take a moment to reflect on the recent past, especially our financial behaviors surrounding the recession that began in 2008. In the years leading up to the economic downturn, Americans can most aptly be described as swipe-happy. And who could blame us? Interest rates were low, and credit was easy to come by. Between January 2006 and January 2009, average indebted household credit card debt steadily rose, hitting a shocking $19,000 in January 2009. After that, indebtedness took a steep drop. The recession was in full swing, which caused credit to tighten up, defaults to ris, and Americans to start watching their pennies. It appears that credit card debt is on the rise again. A report released by Equifax in August 2014 shows that, nationally, credit card debt increased 2.94% between the second quarter of 2013 and the second quarter of 2014. According to a NerdWallet analysis, the average indebted household had credit card debt of $15,480 in August 2014. This represents a jump from the last time the Nerds crunched the numbers in April 2014, when the average indebted household had credit card debt of $15,191. Although many economists interpret growing credit card debt levels as a sign that consumers are more confident about buying and spending, it’s important to recognize that there are individual benefits to bucking this trend. In other words, if you gritted your teeth and paid down your debt during the recession, there are good reasons not to backslide. For one thing, credit card debt is expensive. As of September 2014, the average credit card interest rate is hovering around 15%. For the millions of Americans carrying thousands in debt, those finance charges are adding up fast. Also, credit card debt can do damage to your credit score. If you’re utilizing more than 30% of the available credit on your cards, you’re hurting the 30% of your credit score that’s determined by amounts owed. Again, the folks racking up thousands in debt are very likely exceeding this threshold – and dinging their credit as a result. Every time you’re tempted to overspend, think back to how unpleasant it was to pay off your debt in the first place. Chances are, you don’t want to end up in that situation again. Write up a budget you can live with and stick to it. It’s easier to stay out of debt when you know where every dollar is going. Track your spending carefully using your credit card issuer’s online banking platform. If you have a history of charging more than you can pay off in one month, it might be wise to check in once a day. Reward yourself. For example, after making six on-time, in-full credit card payments, take yourself to a movie or a nice dinner. Just make sure you work it into the budget. Consider recruiting an accountability partner. Have a friend or family member check in on you from time to time to be sure you’re maintaining a debt-free lifestyle, and empower them to call you out if you’re overspending. The bottom line: Americans are getting more comfortable with charging up their credit cards again, but you don’t have to be one of them. Keep the Nerds’ tips in mind to keep from backsliding into bad credit card habits!